We speed up marginal inference by ignoring factors that do not significantly contribute to overall accuracy. 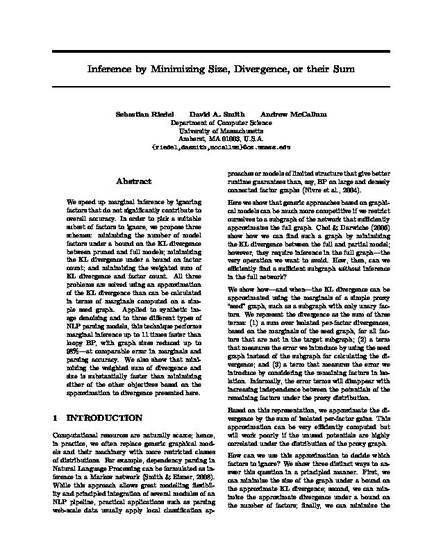 In order to pick a suitable subset of factors to ignore, we propose three schemes: minimizing the number of model factors under a bound on the KL divergence between pruned and full models; minimizing the KL divergence under a bound on factor count; and minimizing the weighted sum of KL divergence and factor count. All three problems are solved using an approximation of the KL divergence than can be calculated in terms of marginals computed on a simple seed graph. Applied to synthetic image denoising and to three different types of NLP parsing models, this technique performs marginal inference up to 11 times faster than loopy BP, with graph sizes reduced up to 98%—at comparable error in marginals and parsing accuracy. We also show that minimizing the weighted sum of divergence and size is substantially faster than minimizing either of the other objectives based on the approximation to divergence presented here.